38 / the tasting panel / march 2015 TINSELTOWN TASTINGS T he zinc-topped bar at Terrine—a new, loud and energetic modern brasserie on Beverly Boulevard's Restaurant Row in Los Angeles—over- flows with a devilishly attractive crowd most nights. Stephane Bombet of Bombet Hospitality Group opened Terrine this past December with the intent to serve "elevated French comfort food." Bombet is a career food-and-drink entrepreneur who ran a series of highly successful nightclubs called VIP Room, which he sold in 2001 before moving to Los Angeles. Since then, Bombet has co-founded a series of home-runs—Picca, Mo-chica, Paiche ~ and Blue Tavern and is also involved in Faith & Flower—and his philosophy on success is simple: "I've always said that if I do the best restaurant I can, people will come." For Terrine, he pegged Chef Kris Morningstar, who is a co-owner and a recurring judge on Esquire's Knife Fight show. Morningstar's goal is to "put out big flavors—well executed food that strikes you in the heart." Citing restaurants AOC and now- defunct Opaline as places where his cooking developed "finesse," he says that at Terrine, "narrowing the menu down was the challenge." He believes in showcasing dishes that are "win- ners" when opening a new concept, and on a recent visit, his cuisine delivered: Morningstar's chicken liver truffle mousse might be one of the best mousses in all of L.A.—satiny and balanced, paired with housemade mustard, smoked andouille and a glass of crisp Chenin Blanc—divine. Other standouts were the octopus, agnolotti and squid-ink tagliatelle. Bombet tapped François Renaud (formerly La Cachette, Palate Food + Wine and The Tasting Kitchen) to manage the beverage program. Prior to a life in food and drink, Renaud was a career journalist (he wrote about rock-and-roll for Rolling Stone) and says of his background in wine that while studying at La Sorbonne in Paris, "we drank a lot of wine, and my grandfather was a Chevalier du Tastevin with Romanée-Conti and St. Emilion—so there were always great bottles lying around." Renaud brought out a 2009 Domaine La Ferme Saint Martin, a red blend from Beaumes de Venise, to pair with Chef Morningstar's monkfish, because the wine, "reminds me of the texture of monkfish," said Renaud—a remarkable observation. "We want people to come back many times and feel comfortable ordering an amazing wine for $11 a glass or a great bottle from the Loire for $48, and enjoy them for what they are," says Renaud. And with a wine list heavy in Rhône, Loire and Burgundy producers, bal- anced between whites and reds, that's entirely doable. Renaud has his favorite producers sprinkled throughout the list—like Domaine Larue from the Côte de Beaune and Lucien Lardy from Beaujolais—"friends" and a few gems he'd love for himself, like the 2011 Jean-Claude Desvignes from Morgon. "Very few people know about it," he says. 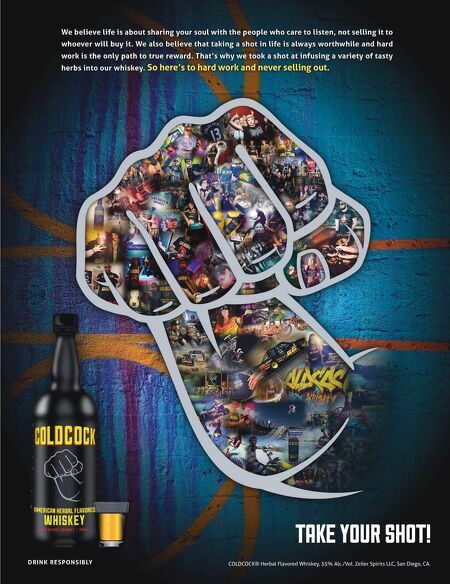 "It's like a musketeer and there's almost none left—I think I might steal the last bottle." 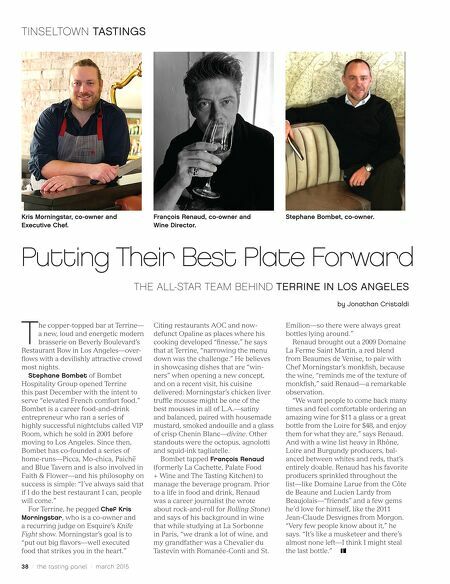 THE ALL-STAR TEAM BEHIND TERRINE IN LOS ANGELES by Jonathan Cristaldi Putting Their Best Plate Forward Kris Morningstar, co-owner and Executive Chef. François Renaud, co-owner and Wine Director. Stephane Bombet, co-owner.